I recently installed Xubuntu 18.04 on a DELL XPS 15 with hi-dpi screen, and no matter what I can't make the mouse cursor larger. It's currently so small I can't see it. How can I set the cursor size? 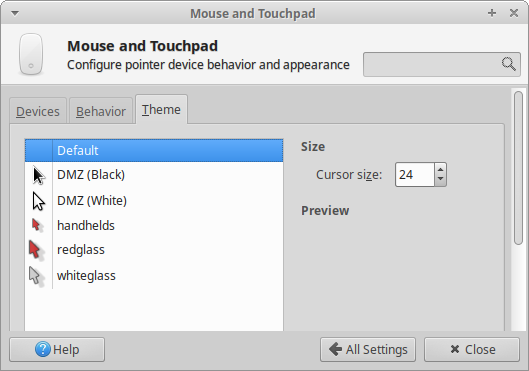 In Settings -> Mouse and Touchpad, choose tab Theme. Not the answer you're looking for? Browse other questions tagged xubuntu cursor or ask your own question. Mouse cursor size behaviour in Gnome Shell? Why is caret/cursor invisible in mcedit in Xubuntu 16.04?